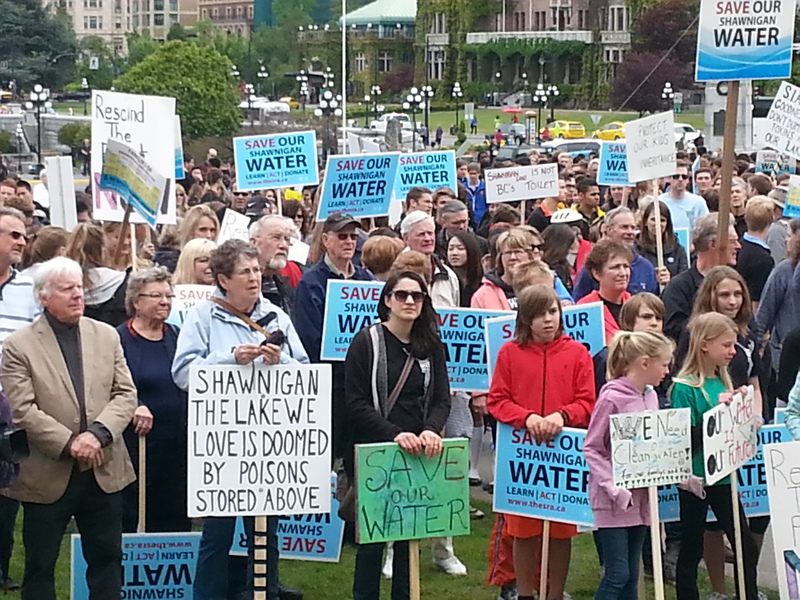 Yesterday, over 1000 people gathered at the BC Legislature to sent a clear message to the government of BC: we will fight the spectacularly stupid decision to allow a toxic dump in our watershed. A huge thank you to the extraordinary volunteers who organized the rally – Victoria, Netta, Sally, Sierra, Anne-Marie, Lois, Jennie, Al, and many others worked tirelessly to bring together an incredible event. Thank you also to all those who collected signatures over the last six weeks – you have brought over 15,000 allies to this fight. We are not a small group – we are a united community and our support comes from across Vancouver Island, the mainland, and across BC. And that support will only continue to grow. We will persevere no matter how long it takes, no matter what it takes. We will persevere because we are on the side of what is right, we are on the side of clean drinking water, we are on the side of ensuring the future of Shawnigan. We know that this fight is going to be hard, that there will be setbacks, and that we will at times feel discouraged. However, what we are fighting for –drinking water and the future of our community – is worth fighting for with everything we’ve got. It is essential to remember that the outcome we are seeking – the revoking of the permit and the clean up of this site – will take enormous effort, and we cannot allow ourselves to relent. Every day, I am so amazed and impressed by the kindness, support, and caring that people in the community are showing for each other. Know that this is what will keep us strong, and know that every act of kindness and compassion moves us one step closer to victory. There are many avenues that we will continue to pursue. As a community, we need to carry on supporting each other. Some leaders will need to step back, and allow for the opportunity for new leaders to step forward. I will organize a community meeting and announce the date early next week – watch for updates here and on social media. On Wedesday, May 20th, the Capital Regional District Water Supply Commission will discuss the following motion: BE IT RESOLVED THAT the Regional Water Supply Commission direct staff to report on the potential impact of the South Island Aggregates facility on the Sooke Lake water supply in light of new information considered during the BC Environmental Assessment Board process. The meeting is open to the public, and takes place at 625 Fisgard Street, 6th Floor Boardroom, at 12:30 pm. If you are able, please consider attending. Watch for announcements this coming week on a number of fronts – we are just getting started. Stay strong, Shawnigan.